Containers created using osctl are actually LXC containers. osctl provides an abstracted interface to control these containers, while in fact every container can be run under a different user and within a different resource group. It can be useful to know what is osctld actually doing for you and how you can manipulate the LXC containers directly. The first step is understanding how osctld uses ZFS pools. Dataset tank/conf is used to store configuration files for users, groups, containers, repositories and migrations in respective subdirectories. The configuration files actually define those entities, i.e. when there is no configuration file for a container, the container does not exist. tank/ct contains subdatasets, one for every container, named by container ids. These datasets contain the containers' rootfs and have their user/group ids shifted into the user namespace. tank/log is used to store log files generated by lxc-start, one for each container. tank/repository contains local caches for remote template repositories. Whenever you create a container using a template from a remote repository, the downloaded template is cached for later use. Users representing user namespaces are stored in dataset tank/user. Each user has a subdataset bearing the user's name. We're calling these subdatasets user dataset or user dir (they are not the user's home directory). User directories contain subdirectories for every user/group combination that any containers are using. These directories are what LXC calls LXC home or LXC path, which by default in LXC is /var/lib/lxc. In vpsAdminOS, there is one LXC path for every user/group combination used by containers. Inside LXC path are directories representing containers, containing config files read by LXC. If VALID is not true for some asset, it means that either it does not exist or is invalid, such as wrong file owner, group or access mode. Use option -v to show these errors. osctl ct cd -r | --runtime <id> for the mounted rootfs, available only when the container is running. A new shell with a modified prompt is spawned. Simply exit the shell to return to your previous session. Administrators can use osctl ct attach to enter containers and get root shell, without the need of knowing password for SSH or osctl ct console. osctl is by default trying to unify the shell interface from the administrator's point of view, so that whatever container you enter, you always get the same prompt and behaviour. This is done by ignoring shell configuration from the container and configuring the shell from the host. If you wish to open the shell and load configuration from the container, you can use option -u, --user-shell. When you find a misbehaving process on the host, you need to identify to which container the process belongs to, so that you may notify its owner or set a limit. You could do this manually by looking at /proc/<pid>/cgroup and identifying the container by the cgroup path. This is what osctl ct pid does. You give it process IDs as seen on the host and it will tell you what containers they belong to. osctl ct top is a top-like TUI application that monitors real-time resource usage. Instead of processes it monitors containers. It can work in two modes: real-time and cumulative. Real-time shows resource consumption since the last update, i.e. 1 second by default. 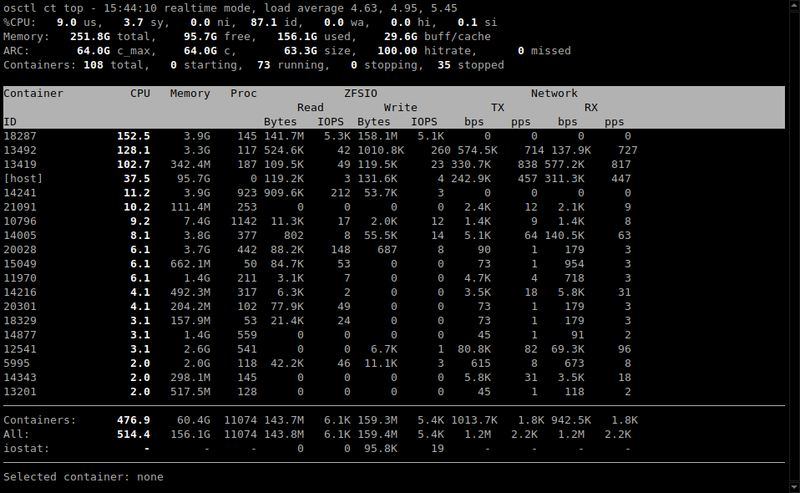 Cumulative shows resource usage since the program was started. Mode can be switched by pressing m.
Left and right arrows can be used to change the sort column, r to reverse sort order. Up and down arrows move selection cursor up and down, spacebar will highlight selected container for easier spotting. Enter/return key will open htop focused on the selected container, see below. Press ? to show all key bindings. htop in vpsAdminOS is patched to be able to identify to which containers processes belong. It has four extra columns: POOL, CTID, NSPID and NSUID. For container processes, NSPID shows the process ID and NSUID the process user ID as it is seen inside the container, i.e. its user namespace. 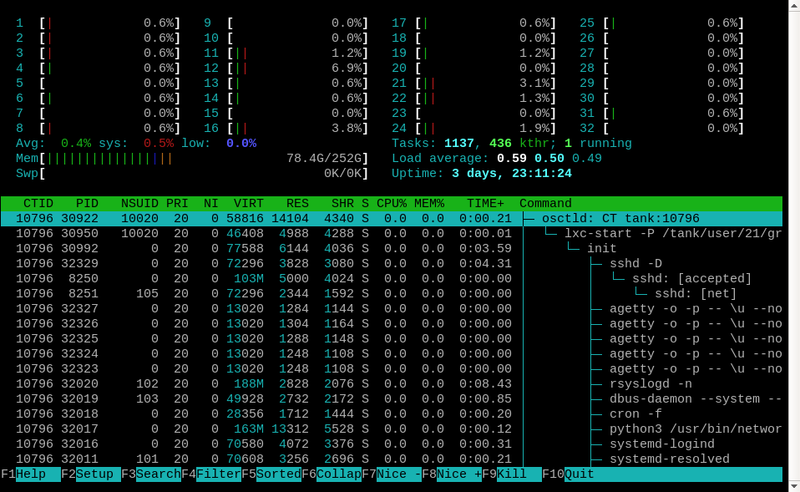 Our htop can filter processes by container ID. You can use CLI option -c, --container to select which container to filter at start, e.g. : htop -c tank:10796. Filters can also be changed at runtime, press n and select a container, the host, or all processes. When debugging a container that's failing to start, you can enable LXC debug messages using osctl ct start --debug. Note that the container has to be stopped for the reload to be allowed. Should you want to switch to a container's user and use LXC utilities directly, you have to use osctl ct su <id>. Using /bin/su is insufficient, because standard su does not manage cgroups. osctl ct su will open a shell with the same environment as osctld itself is using to start the container. Do not use this shell to manipulate any other container than myct01. The shell uses /tank/user/myuser01/group.default/cts/myct01/.bashrc instead of ~/.bashrc, see user assets above. The shell can be used to manipulate only the chosen container, because every container has a specific cgroup path, so running other containers would put them to a wrong group. The LXC utilities are unmodified except for the implicit arguments, which let you forget that there is a non-default LXC path and some container id.